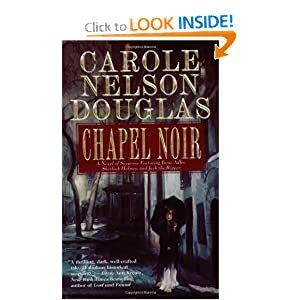 There are many tense moments in this conclusion to the story begun in Chapel Noir. And although Nell remains a bit too discursive for my taste, she is finally beginning to develop beyond the priggish prude that inhabits the earlier books. And I still find myself skimming over long sections of backstory rehearsing things we already know or "sermons" on various topics, such as gender role expectations and such. 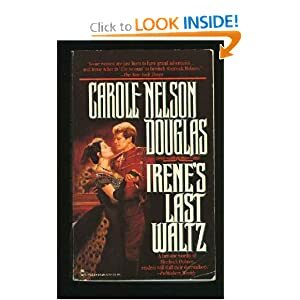 In addition to the existing historical characters that populate previous books and this one, we add a nascent Rasputin. Here's a nice quote: Through the fog and smoke the streets shone like a black cat's well-licked coat. Chapel Noir is a departure from the pattern of the previous four. First, it's told from three different viewpoints. Second, it's a cliff-hanger, continued in Castle Rouge. Third, it's darker and more graphic, dealing as it does with Jack the Ripper. Extension to the Holmes canon. Stylistically consistent with the canon (excepting the some of the alternate viewpoint material). Cameo Holmes appearances, actually, fairly substantive appearances. There continue to be, for me, some very skimmable passages of fashion, description, and back story. There are moments when Nell's obtuse naivete strains credulity and her moralizing personality begins to wear. Although, based on some dramatic developments at the end, I suspect that might be attenuated somewhat in the future. Or not. Her red hair was frizzled into a fright wig. Her decolletage overflowed a wasp-waisted bodice like two loaves of unbaked French bred. She had a sharp nose above a cheese-soft chin that faded into the high collar of fat cushioning her throat like a necklace of fleshy aspic. Her bead-bright eyes moved like roaches in the suet pudding of her face to study us. 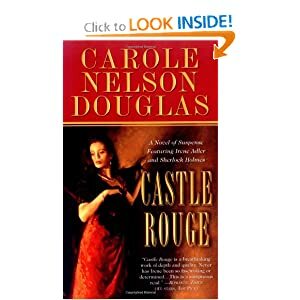 Douglas does a great job of weaving canonical story lines into a new story, and this one is no exception. There are a lot of things happening on a lot of levels with several nice appearances of a certain personage. One of those plot lines involves Charles Frederick Worth, the legendary designer. As a result, I resorted to a bit of skimming over the copious descriptions of fashion. YMMV. 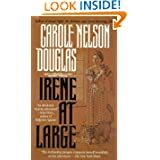 This book was reissued as Another Scandal in Bohemia in 2003. I like it when an extracononical story pulls in either contemporary references to historical figures or canonical characters. 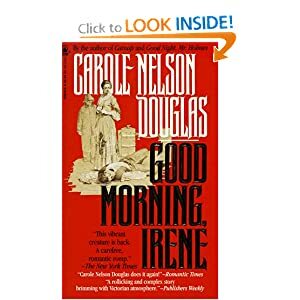 In this installment of the Irene Adler saga, Douglas pulls in a character from the Holmes story "The Case of the Empty House" in which Holmes thwarts his own assassination by the second most dangerousm man in England, Colonel Sebastian Moran. She does an excellent job of integrating the story line with what will happen five years later in the Doyle story, even explaining why Watson acts as if he's never heard of Moran later. One thing I'm not as much a fan of is the descriptions of fashion and extended banter. I expect female readers may have a different opinion, which is good since the majority of readers are female, but I find myself skimming sections that don't deal with the plot. This book was reissued as A Soul of Steel in 2006. Two years ago I read Good Night, Mr. Holmes. I said I couldn't wait to read some more, but I did. Wait, that is. And now I've read some more and I'm glad I did. As in the previous book, there is a brush with Sherlock Holmes, but it's not the focus of the story. Rather, the mystery of tattooed corpses missing a finger lead the trio (Irene, Godfrey, and chronicler Nell) from Paris to Monaco. Entertaining reading for Holmes fans and others. "The longer I spoke the more convinced I became that I was hanging a sheep for a lamb." I liked that one because of how she mangles the saying, "Might as well be hung for a sheep as for a lamb." into hanging the animals. "I will say this: that while in the relationships between men and women there is much stuff of comedy and tragedy, there can be found in the marital bed an intimacy that mingles the best of the human and the divine." FYI, the book was reissued as The Adventuress in 2003.